"It's nice to see my bike dork friends,"
Not to trump Curtis's moment in the media, I was in the New York Times. This article was about a swap meet we went to to sell some of our beater bikes. These bikes were all rideable, but were cosmetically challenged and some were more beater than bike, so we brought to sell cheap, to make space in the shop. Sometimes when we buy bikes, we are forced to buy a whole collection, rather than just cherrypicking the pile for 5 awesome bikes, we get 5 awesome bikes, 10 ok bikes, and 10 not so good bikes. We donate some to causes, and to some people down on their luck, and are stuck with some that we can't sell at the shop. Philadelphia is the city of Chrome city bikes. Via Bicycle is now personally responsible for at least 6 chrome city bikes. 3 are owned by employees(well one previous employee) and they are set up super awesome and every bit to ogle over. Photos to come in some post in the future. One is a Carlton built, but badged Huffy from the 1960s. It is set up as a Sturmey Archer 3 speed, with Honjo fenders and Velo Orange Porteur rack and handlebars. One is my old chrome Rudge, also built up as a Sturmey Archer 3 speed, with Velo Orange handlebars, Campagnolo cranks, Mafac brakes, etc. My chrome bike is a French Rochet, currently set up as fixed gear, with Honjo Le Paon style fenders, Velo Orange Handlebars and Porteur rack. All three bikes are set up with inverse levers and to the untrained eye, all three bikes look very similar, all chrome and shiney and all that. The bike photographed below, a chrome Raleigh, was purchased from the shop, but set up elsewhere. But we still see it as our baby, as it fits into our Chrome Bike Posse. It is set up as a 10 speed, with upright handlebars, Brooks b-72 saddle, Shimano Arabesque 600 drivetrain. It even as a little TA front rack, for good measure. Some people are against restorations of bicycles when they are not done faithfully to the original design on the bicycle. I usually am. I am usually the first to point out incorrect paint color, cable housing, tires, etc. But when the restoration is so far from the original design, I guess it creates a life of it's own. Take this Humber. Humbers were known for their distinctive twin fork blades and beautiful chainring design that has people merrily holding hands. The owner of this bike kept some of the original idea, but added a French brake lever, newer handlebars, cork handlebar tape, a homemade saddle canister, and what looks like homemade trussrods. The sign and even white 26 x 1 3/8" tires really make this bike into a new bicycle. Equipped with a front brake and a Sturmey Archer 3 speed coaster brake hub. and the headset has greaseports. Arthur A Zimmerman was the first superstar of bicycle racing. Born in Camden, New Jersey, he later, after retirement, had bicycles built with his name in Freehold, NJ. Examples of the bicycle are extremely rare. Below are photos showing the Zimmy in all it's beauty. Good luck seeing another one. the Veteran Cycle Club. The book is full of images of Zimmerman and his accolades. While on the road, we find ourselves staying with friends and family and this time we stayed with Curtis's cousin who happens to be the proud owner of a 1937 Knucklehead, along with a lovely dog, Maddy, and cat. After taking a couple pictures of it in the garage, he decided to pull it out and do some technical maneuvers around the yard. Seeing him navigate at such slow speeds, doing tight turns on varied terrain with a foot clutch nonetheless, I realized I was watching someone that was in tune with his machine. It reminded me of technical bike riding, where bicyclists ride at very slow speeds to traverse over logs, rocks and other obstacles, not allowing the rider's foot to touch the ground. At the last swap meet I was at, a fellow swapper and lover of all things interesting, brought his homemade cargo bike. I love shape of the basket, we were discussing the shape and how it would be perfect for potato harvesting, or maybe pumpkins? Is is one of of only 2 known examples of this highly unconventional frame. it was built with the intention of correcting chainline issues, allowing the chainring to move from side to side, for adjusting the chainline. The chainring is adjusted with a modified Cyclo Benelux rear derailleur that is affixed to it. I guess Suntour also thought about this with their Asymmetrical downtube shifters, that in shifting the rear derailleur, the shifter boss adjusts the throw of the front shifter, trimming the front derailleur to adjust the chainline. I would love to know how the Vampire Convincable shifting rides. that I feature on this bike belong to a select few collectors that are gracious enough to show their awesome collection. I don't want to name names, unless they want me to give them credit. 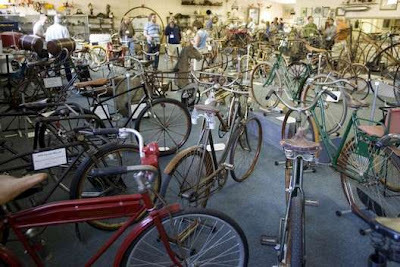 It is sometimes hard to know what bicycles are out there, especially if collectors keep them hidden away in there attics, basements, and garages. I am happy I have the opportunity to travel around the country, and the world, and meet people that are as interested(or more!) bicycles and bicycle history as I am. I have no problem showcasing some of the super rare/cool bikes that I find to show the internet world that these bicycles are out there. Just think about it, many diehard collectors had never seen a Rene Herse, and now it seems everyone has one! I love traveling to see people's cool collections. I enjoy the stories involved finding the bikes, the process of restoration, the provenance of rare pieces. Provenance is everything to high end collectors. The history of the bicycle, the story involved, is critical to it's importance and collector value. In rare cases, not just who the bicycle was built for, but from what collection it came from add value. It starts to mirror the world of fine art, like a Picasso owned by de Kooning, or a Hirst owned by Gagosian. So this post is a salute to those awesome collectors that love to share what we fellow collectors covet. Feel free to invite me into your chapel and we can talk about bikes and adventures, from dingy basements or dusty attics, stinky barns to rusty junk yards. Here are two sheets of Daniel Rebour drawing that I acquired this spring. I have always loved his drawings and finally bought the drawings for myself, this is after I bought a sheet for my boss a couple years ago. He did drawings for most of the French manufacturers including Rene Herse, Alex Singer, Simplex, and others. The Data Book has a bunch of his illustrations. it can be purchased from Van der Plas Publishing. On Aldo Ross's excellent blog- Welcome to the Island of Misfit Bicycle- he actually features one of the bicycle lights illustrated on my drawing. His blog features many cool pictures from le Cycle, But Club, and other French cycling magazines.